Forex trading is widespread and has become a global phenomenon. Its market is open 24 hours a day from Monday to Friday. The co-business in Forex trading is determining movements in ‘currency pairs’ overtime. To achieve this, a number of tools are employed. These tools capture trends, data and behavior of currencies and can be able to predict with lower margins of errors the likely currency movement. These tools help traders to make informed decisions and sound judgments as pertaining to trading decisions. Each tool has its own strength and at the same time, its weaknesses. It is incumbent upon the trader to analyze these strengths and weaknesses and determine the set of tools that serve his tastes and preferences. 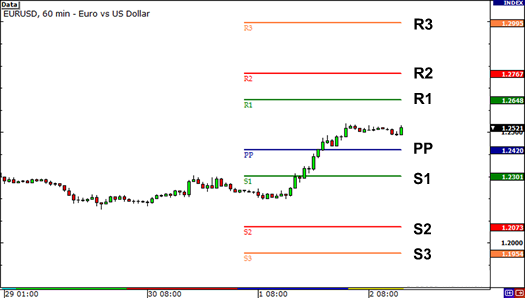 Chart indicators have often been used by traders because of their visual aspects and ease of understanding. They aid traders in making technical analyses in the currency market. Chart indicators can be classified as either lagging or leading. Before a new trend comes into being or prior to a reversal happening, there are indicators that can help you identify opportunities to trade. These early bird indicators are referred to as leading indicators. The reason they are loved by Forex traders is because they provide some sort of leakage into an imminent change in trend. Pivot points which are among the most effective indicators in this category help in establishing points where the trader can stop, take profit or enter a trade. Many methods have been devised to aid in the calculation of pivot points in the currency market. None of the methods is superior to the other and the resulting figures all lead to almost the same conclusion but with varying degrees of certainty. Pivot points are not the only leading indicators. The family is large and the other members include oscillators such as Parabolic SAR, RSI (Relative Strength Index) and stochastic patterns. The bottom line to all these leading indicators is that they help in the identification of potential reversal points in the Forex market. These are the points where the forces either bullish or bearish that have dominated for some time give way or diminish. At this point also, price changes direction. As tools of trading, leading indicators should be interpreted in the company of other indicators and never in isolation. Other analysis methodologies are usually invoked if a trader is to have a balanced conclusion on the likely happenings of the Forex market. The other set of indicators are known as lagging indicators. As opposed to the leading indicators, the lagging indicators identifying trading opportunities after the trends have taken shape. Due to the fact that they report events after they have already happened, these indicators are not very common with conventional traders. They have the potential to delay your entry into a trade. The advantage with lagging indicators is that they have minimal margins of errors since they are reporting trend reversals that have already taken place. Being momentum indicators, some lagging indicators are more popular than others. The Moving Average Convergence Divergence (MACD) is among the favorites in this category. Moving averages come in different types ranging from simple, weighted to exponential. To achieve success in Forex trading, traders most often combine both leading and lagging indicators in varying degrees and proportions. These help them in making concrete trade decisions which they are likely to profit from. 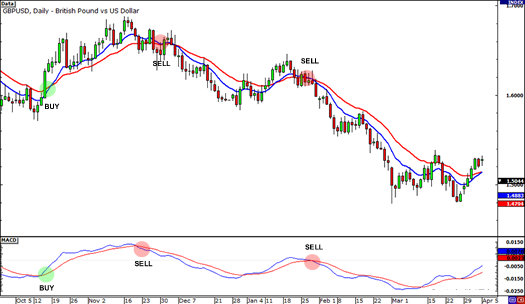 An example is when a trader decides to employ stochastic and MACD in attempt to identify the existing trends in the Forex market. Though success is hard to come by in the Forex market, the secret lies in the mastery of the tools and techniques at the disposal of the trader. You're overstepping yourself. There is no such thing as a "leading" indicator. Examples of leading indicators are Stochastic Indicator and Relative Strength Index (RSI). These indicators attempt to identify points where the market is either overbought and likely to reverse down or oversold and likely to reverse and curve back up. Leading Indicators are in essence the Oscillators. An oscillator is any object or data that moves back and forth between two points. Incorrect on both counts. Price-based indicators can't change until price does. Therefore they can't lead. And I know what an oscillator is. Thank you. And I've read Appel and Lane. When you trade a leading indicator, you by definition have probabilistic control over your risk, because you will always have a clearly defined stop level that is not merely guessed at, but probabilistically derived as a key component of the indicator itself (built-in risk control). Again, there is no such thing as a leading indicator, and repeating the assertion does not make it any more true. As for probabilistic control, all one has to do is learn how to read price movement, as talented and skilled traders commonly used to be able to do. 1 how in the heck is Parabolic SAR a "leading indicator"? 2 how in the heck is prev SR not a "leading indicator"?